Sub :- Spot Check of Pension Payments by Pension Disbursing Banks. Expenditure on Pension accounts has increased substantially due to revision of pension as per 7th CPC. 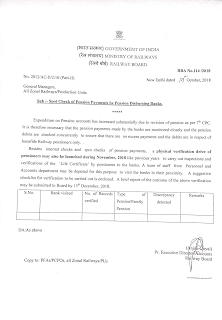 It is therefore necessary that the pension payments made by the banks are monitored closely and the pension debits are checked concurrently to ensure that there are no excess payments and the debits are in respect of bonafide Railway pensioners only. Besides internal checks and spot checks of pension payments, a physical verification drive of pensioners may also be launched during November, 2018 like previous years to carry out inspections and verifications of the ‘Life Certificate” by pensioners to the banks. A team of staff from Personnel and Accounts department may be deputed for this purpose to visit the banks in their proximity. A suggestive checklist for verification to be carried out is enclosed. A brief report of the outcome of the above verification may be submitted to Board by 15th December, 2018. 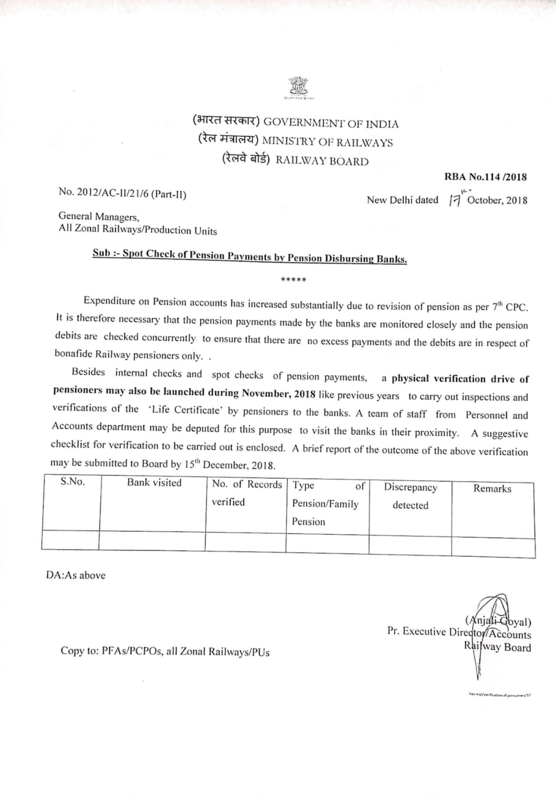 Pension payments made by the banks are monitored closely and the pension debits are checked concurrently to ensure that there are no excess payments and the debits are in respect of bonafide Railway pensioners only.